The Weber Summit S-470 4 Burner Stainless Steel Gas Grill is an impressive barbecue and is what is known as the “Big Boy of Barbecues”. If you are serious about your grilling then this BBQ definitely won’t disappoint. Designed to be more than just a BBQ, the Summit S-470 also comes with a rotisserie, sear station, smoking chamber, side burner and warming rack that will make the home gourmet chef extremely happy. This stainless steel unit is a very strong unit made with steel welded frames. The stainless steel hood has cast aluminium end caps on each end to add extra strength. Large stainless steel side tables situated on each end are generous in size and strong, with one having a large gas burner for any additional cooking needed to make your barbecue a feast. One unique feature is the grill out handle lights with sensor that is activated automatically when you lift the lid making night time cooking a breeze. But the most awesome feature is the rotisserie which can hold two full sized chickens. Mounted on the lid behind the rotisserie is a rear mounted infrared burner and is used for the first twenty minutes at the beginning of cooking process to brown the chickens. Then the roast is finished off using the indirect cooking method. The rotisserie motor is positioned on the left of the grill and cleverly folds down after use to leave the side table flush and free for other uses. The grill burners are individually lit with a snap jet ignition system and the heat is retained extremely well with the thick 9mm stainless steel rods that give steaks an awesome professional patterned look. Featured behind the grill is the smoking chamber with its separate burner that will give your meal a lovely smoky flavour. A one touch fuel gauge will let you know exactly where you are with your gas consumption. Weight is 241 pounds – Measures 30 inches long by 66 inches wide by 57 inches high and comes with a roomy stainless steel two door cupboard finished off with polished chrome handles. A place where you can keep your gas tank tucked away neatly inside with somewhere to put the other accessories. The Weber Summit S-470 Stainless-Steel Gas Grill comes pre-assembled and only needs minor assembly to achieve your finished product and comes with a 5-year limited warranty. Read the full story and watch the video over here now. Want the to be the envy of the neighborhood? 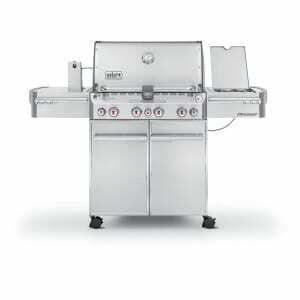 Then check out the big brother to this grill, the Weber Summit S-670 Stainless Steel Propane Grill over here. “I have not been disappointed with this barbecue. I was able to put two five pound marinated whole chickens on the spit. The chicken was incredibly moist and tender”. “Positively the best gas grill I have ever owned. I purchased this after extensive research and am not disappointed. My first time out I used the rotisserie but forgot to turn on the dedicated burner and still the chicken came out terrific! There are so many bells and whistles on this unit; I am extremely impressed with the quality of stainless steel cabinet. Everything about this grill is top quality from the drip pan to the tank measurement system”.